We have had a week of warm temperatures, with most maximums being 30 degrees or over. Disappointingly, there have been strong hot westerly winds as well which have caused damage to some of the perennials, those that have softer stalks. No matter, they will soon recover. Yesterday, after an unpleasant day of wind and heat, we had a thunderstorm bringing a reviving 5ml of rain. Again, stepping outside on the cool damp grass this morning was such a pleasure. The fire season has well and truly started with an out of control fire burning just south of Canberra. There wasn't enough rain there to extinguish the flames, although firefighters are saying they hope to have the fire under control before too long. Six on Saturday is a meme hosted by The Propagator. An interesting and enjoyable time can be had by popping over to his blog and reading what other gardeners are doing in their gardens. There's such a wonderful group of interested and interesting gardeners to be found there. 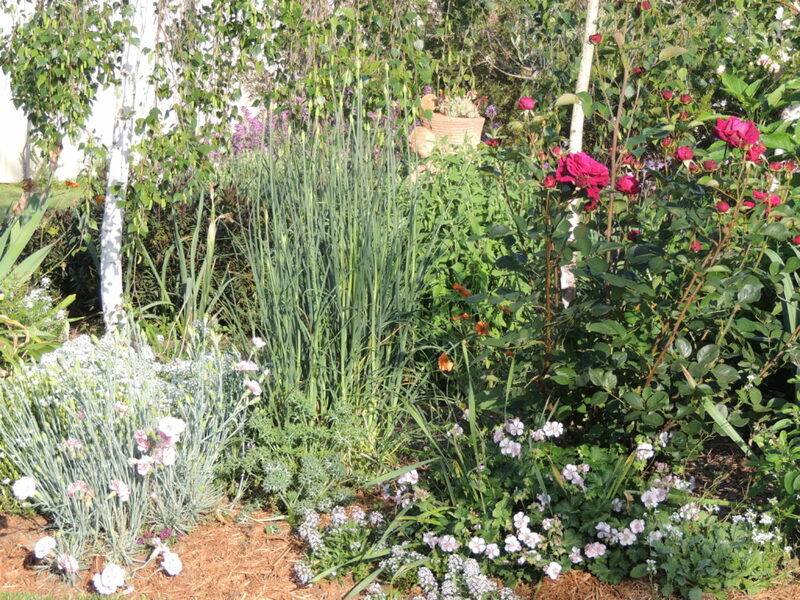 One: From the back of the house, part of the garden dominated at the moment by a prostrate Ceonothus which has grown quite large and will need to be judiciously pruned when it has finished flowering. In the foreground dwarf salvias are coming into flower, and around the edge of the garden is an Echeveria 'hedge' which was grown (over time) from one cutting given by a friend. Two: A winding gravel path behind the Ceonothus divides this part of the back garden in two. Three: This is 'Flora's Garden' which I featured here during the Winter, but is now full of healthy plants with a few more such as Agastache 'Sweet Lilli' to show their faces. That's Rosa 'The Prince' on the right, and in the middle Allium 'Drumsticks' are getting ready to flower. Four: Not a view essentially, but I do like these Romneya coulteri. The way their petals droop reminds me of the white costumes of Whirling Dervishes as they wheel around during their mesmerising religious dance. Five: This is Clothesline Corner, with its inherited pavers, white stones and metal fence. 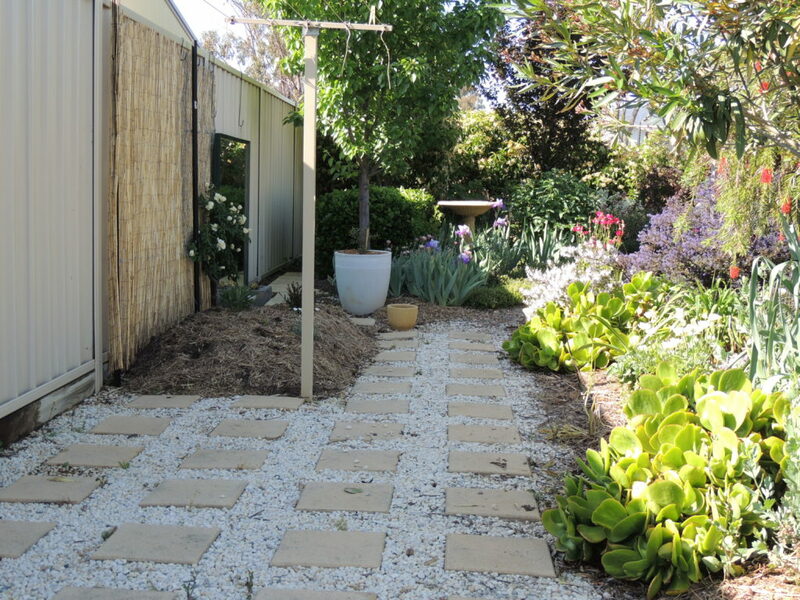 A project for next Winter is to lift the pavers and cover the white stones with something of a more subdued nature, probably gravel like the path in photo number two. The metal fences, which are used so much in this area, are a problem: when the temperatures are high, those fences add to the heat. They are being covered, but it's a slow process. Patience- the quality I've had to learn when it comes to gardening! Six: Not everything in the garden is pretty! This is the 'Dead Pots' Society' which meets behind the shed. Old plastic pots, a broken terracotta pot (to be used as filler in a wall somewhere), an inherited drum which we could have done without (thank you previous owners) various stakes and collections of stones. I think most gardeners have a corner like this in their garden somewhere. Do you? That's my six for this week. Happy gardening everyone. Weather today: Sunny, windy, 17-32 degrees C.
That mirror was going to be taken to the tip, so I thought I should give it a home. I often wonder if it might start a fire on a particularly hot day! Great to see those views your garden. It looks lovely. 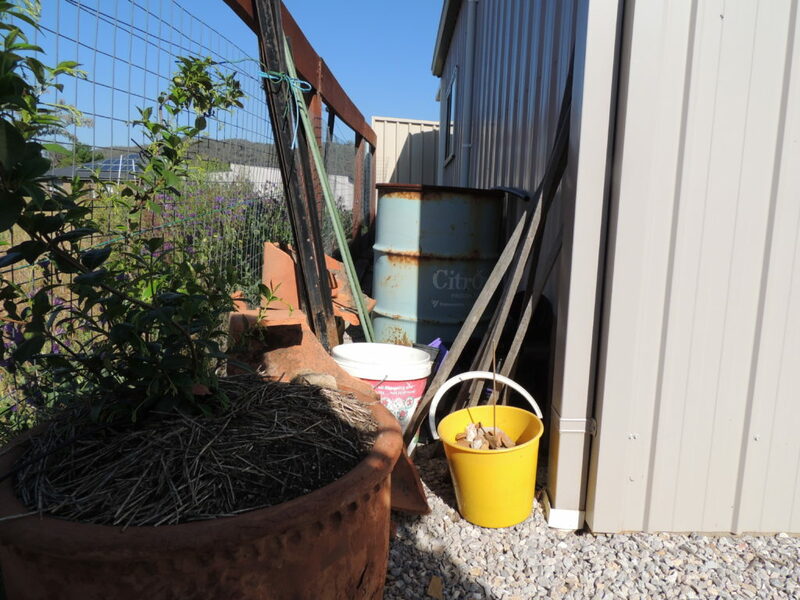 The back of our blue shed is a dumping ground for pots and bags of compost! I feel sure most gardens must have a spot like that. It’s fascinating how from a UK perspective your garden is familiar and alien at the same time. 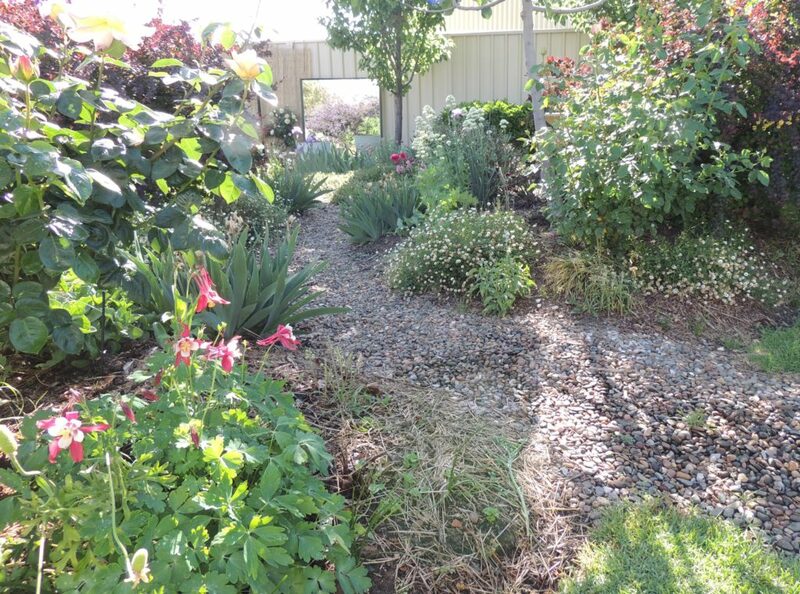 The first picture could be achieved here if you bedded out the Echeverias, except for the weeping Callistemon at the back. We’re always trying to grow plants from hotter climates, your’e doing the opposite and there’s a big overlap. That’s true Jim. And it’s amazing how well plants will do when they’re in an alien environment, despite everything. Something to be grateful for. So pretty Jane. You must be ecstatic watching everything coming into bloom. Winter is always worth the long wait because you are rewarded abundantly in spring and summer. If we didn’t have Christmas in winter, I don’t know how I’d survive it. Keep those beautiful photos coming. They cheer my soul. Thank you, Cindy. Winter does seem long and tiresome, even here, where we don’t have snowstorms and dampness, and mostly the sun shines. I’m happy that my photos are cheering you up. What a gorgeous series of images, Jane. The co-ordinating colours in #1 are truly sublime, but then I am a ‘sucker’ for the cool blues, mauves and even a few pinks. I think my choice of colours was quite unconscious, Vicki, and somehow they seemed to work. Perhaps I’m a blue, mauve and a bit of pink kind of person too. Your garden is a delight to wander around Jane. I love the brilliant blue of the ceonothus it is a show stopper. I think I will search one out for my garden. I had to smile at your “dead pots society” I have one round the back of the shed that the nasturtiums have invaded. I’m afraid I can’t tell you the name of the Ceonothus, Pauline, as I don’t have the label any more, but I’ve had a quick search and think it might be ‘Blue Sapphire’. One thing about this plant is that it doesn’t like wet feet. That said, mine is doing fine in a built up garden bed that has clay underneath. Lovely pictures of your spring/ summer garden. It looks dreamy from our perspective of dying flowers and autumnal colours. I love ceanothus and yours is a beautiful cloud of blue even if overgrown. I’m glad you enjoyed the photos Ciar. My turn for autumnal colours and frostbitten plants will come again of course and I’ll be enjoying your Spring! Thanks for the tour, I loved it. Your garden looks wonderful. That rose is a stunner, bet it looks fabulous with the alliums! I am so looking forward to tha Alliums coming out. I wonder if you noticed a couple of cheeky Geum ‘Totally Tangerine’ flowers showing their faces in there as well? Breathtaking views of your garden! I enjoy beautiful photos of individual blooms but seeing the garden as a whole is even better. Lovely Six. Jane, you are speaking a foreign “gardeners” language to me. 🙂 I love the salvia and green swathe of lawn looks particularly appealing. I wouldn’t like anyone to look too closely at that lawn, Tracy, it’s very weedy. Needs a load of soil on top of it, another job to do! Your garden is looking beautiful, Jane. I love those whirling dirvishes! Yes, we have a dead pots corner too! The plant supports and canes live there too, when not in use. Thank you Ali, it’s a wonderful time of the year, so much to enjoy. What a great glimpse into your garden. It looks absolutely beautiful. 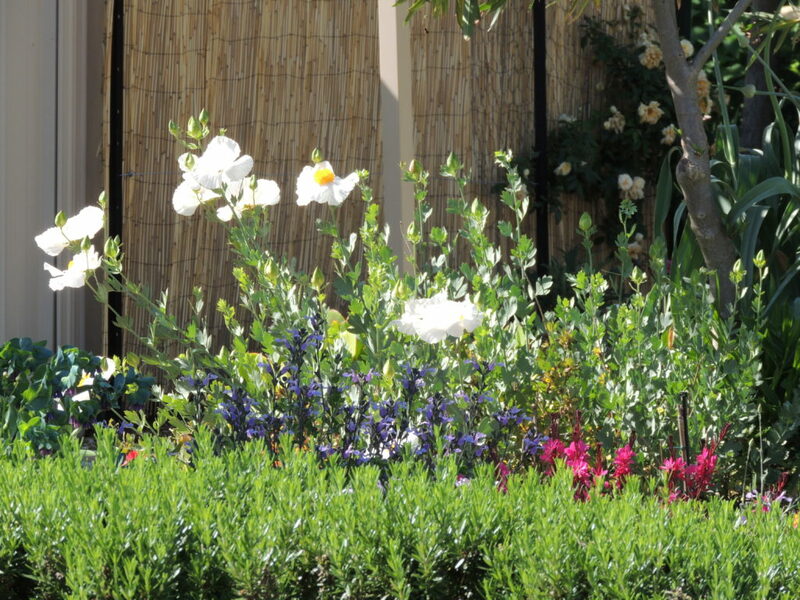 I especially like the Romneya. I hope you have a reasonably mild Summer, with no chance of fires, but fear otherwise! Thank you Tim. I fear there will be fire this summer too, but fingers crossed. We are due some more rain this week according to the forecast, so that will help- if it happens. Do you use a special kind of mirror for outside? That mirror was a friend’s old dressing table mirror, which was going to the tip, so it seemed like a good idea to find a home for it. I don’t know how long the frame will last, although I painted it with Solagard paint. The Dead Pots Society has a well established Devon UK branch. Doubt it not. Your garden is looking fabulous Jane. Oh, summer! Probably DPS chapters all over the world, I imagine. I’m glad to know there’s one in Devon. Yes Summer, and soon to be very hot. Just bought a ceanothus. Hoping to get a good show from it. I hope you do too. No reason why not. You’ll have to post a photo when the time comes. Your garden is looking fabulous, so full if colour. I had to dig up my romneya, it was growing lustily in the house and weaving through the bookshelves, those roots are incredibly invasive. It is pretty though. I’ve been a bit worried about thuggery, Chloris, and although my Romneya has been quite well behaved until now, I’ve recently noticed new shoots where they might not be wanted. I love the flowers and wouldn’t like to have to dig it up. Sigh. Beautiful pictures of your garden, Jane. Yes I think we all have corner like your number 6!! The choice of colours is quite unconscious, Lis, so it must be something that’s inherent in me. But it’s hard to go wrong with flowers, I think, because there’s something lovely in all of them. I need to be careful of the Dead Pots’ Society in case there’s a snake in there as well. I agree. Probably a necessity really. As soon as I throw something out, I find a need for it! Dead Pots Society! How wonderful! 😀 My empties live under my rotting potting table with the rest of the bits and pieces living it up inside the shed! Your garden looks glorious now – doesn’t seem five minutes since things started to ‘happen’. The ceanothus is so pretty, don’t cut it back too much, it looks lovely like that. They do grow here and I would rather like one, but it may have to go in a container as I am running out of planting space! I’ll be very careful pruning the Ceonothus, as I wouldn’t like to strike a death blow. I think they’re a bit touchy about that kind of thing. You’re right about the speed of things…a bit of rain and some sun, and up it all comes- full blown Spring! These days I’m only going out to garden in the morning before it gets too hot. I enjoyed seeing your beautiful back garden, Jane! It’s deliciously floriferous for early spring. I’m sorry to learn that you’re facing high temperatures, wind and wildfires, though – hearing that all too familiar story repeated on the other side of the world only deepens concerns about the uncertain future we’re all facing. And yes, of course I have a dead pots area just like that! I think yours is a bit tidier than mine, which sits between the back wall of our garage and a wood fence separating our property from that of our neighbor on our north side. I want to get rid of the stuff we’ll never use but my husband, more of a pack-rat, is dragging his feet. High temps and fires are frequently a feature of life here in Summer, but I totally agree with what you say about our future, Kris. It’s such a worry. We’ve been lucky to receive some rain which is why we’re having such a bounteous Spring. There’s some more forecast this week which will be wonderful if it eventuates. It seems quite a lot of people have a Dead Pots Society somewhere in their garden! Your garden’s really coming into its own. Lovely to see it flushing out. I’m surprised at the use of metal fences in your climate. Do you know why that was a material people chose? Can’t imagine touching it in mid-sumer. It looks like your covering it w/willow – is that doing the trick? I don’t really know the reason for the metal fences: cost effective maybe? Certainly long lasting and easy to erect. I put that cane behind the rose as it was a quick way to alleviate the problem to a certain extent, but our more permanent method is to erect a structure alongside the fence made of posts with wire stretched between them and leaving a space of about 20cm between. That way air can circulate and we can grow climbing roses, jasmine etc on the new fence, which has to be strong and well-made. It’s quite costly and a slow method, but it seems to work. 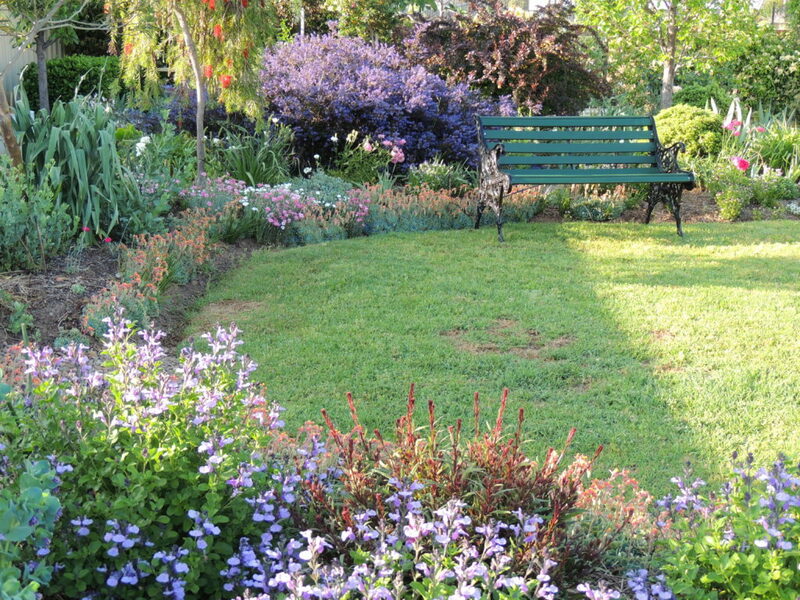 I’m swooning at your garden–just beautiful! Goodness, that’s praise indeed. Thank you, Tina. GREAT POST and AWESOME PHOTOS! Thanks for sharing! Thank you, Anna. That’s a good idea about the old drum, but being realistic I think it’s going to be a Dead Pots’ Society member for a good while yet! The hot weather has retreated for a while, now we have strong wind and a slight dust storm!